Birthday cake magnets? I do have some news about birthday cake magnets and other goodies! 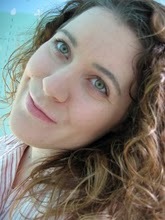 Today it’s Christine’s birthday and I have some giveaway news to share with you. Before I reveal the news about the giveaways, I wanted to let you know about the sign I’m standing next to. Christine’s friend, Kate, sent this lovely hand-painted wooden plaque to her as an early birthday gift. Kate hand-painted it herself and the colors she selected match perfectly in Christine’s room. 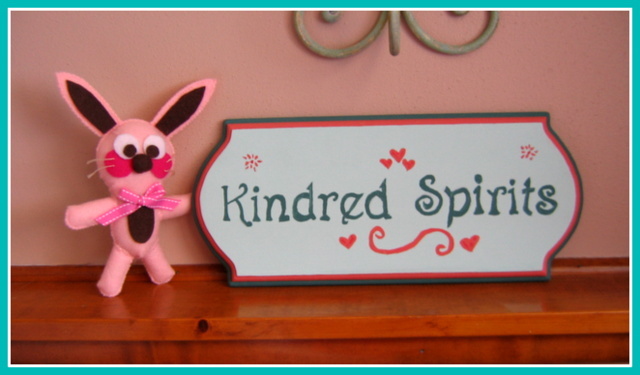 It reads “Kindred Spirits” because both Kate and Christine have been fans of the Anne of Green Gables books where Anne is always looking for a Kindred Spirit. Enter to Win this Birthday Cake Magnet Set! Since it is Christine’s birthday, she wanted to celebrate by giving away a set of her handmade fridge magnets. In the photo above you can see the set she is giving away this year. How can you win this set of magnets? Read on……. Which cake flavor is Christine’s favorite? 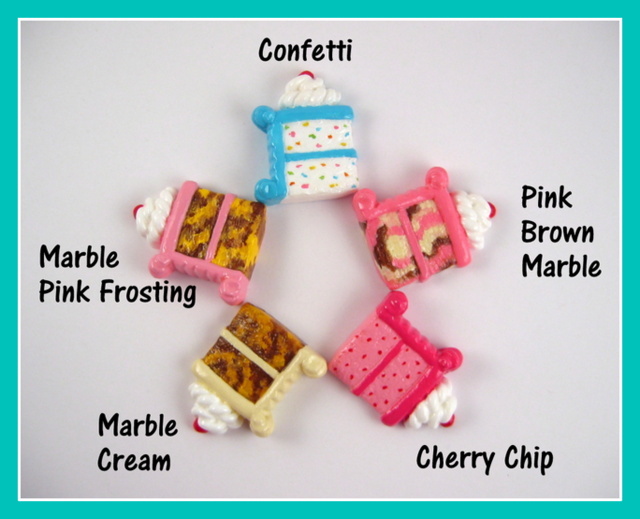 Here are five assorted birthday cake magnets each labeled with a specific flavor. 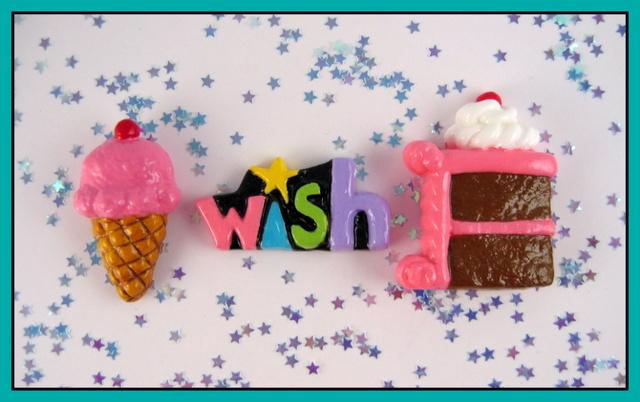 Christine just added these specialty flavor birthday cake magnets to her Etsy store, Lilly Bug Boutique. Within this set of five cake slices is one of Christine’s favorite flavors. To enter to win the contest, leave a comment with your guess of which cake flavor is her favorite. All comments will be included in the drawing whether or not they guessed the correct flavor. Please leave only one comment/guess. Those who leave more than one comment will only be entered once into the drawing. 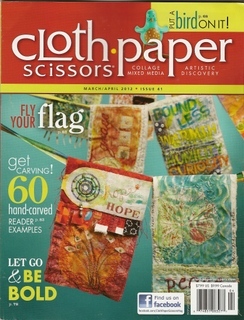 The drawing ends on Friday, March 22nd at 11:59 CST. Please invite others to participate. Good luck! Giveaway closed! Christine’s favorite cake flavor is “Cherry Chip.” The winner of the magnets set is Kristen. Congrats! 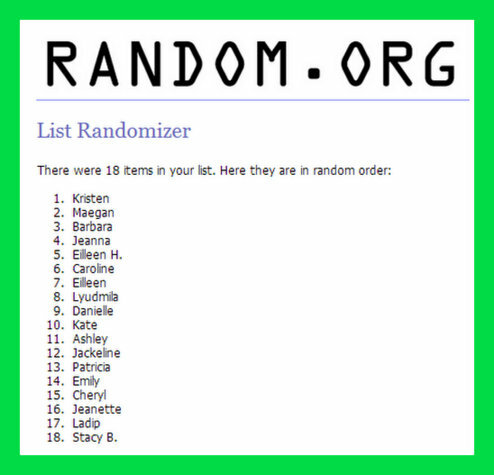 The Book Monster giveaway winner! Before I end today’s post, I have one more bit of important news to share. 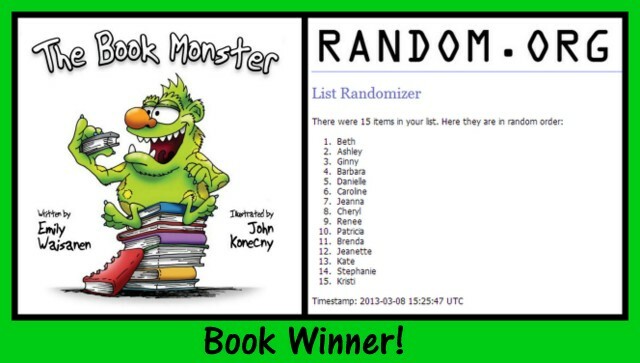 The winner of a copy of Emily Waisanen’s “The Book Monster” is Beth. Congratulations! If you missed my book review of Emily’s book, please click here to see it. I think you will enjoy learning about her adorable children’s book. 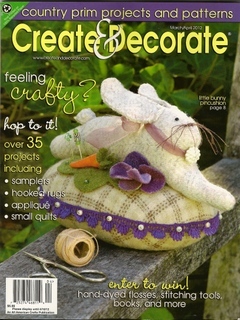 A watercolor and sculpture artist and avid crafter/designer. 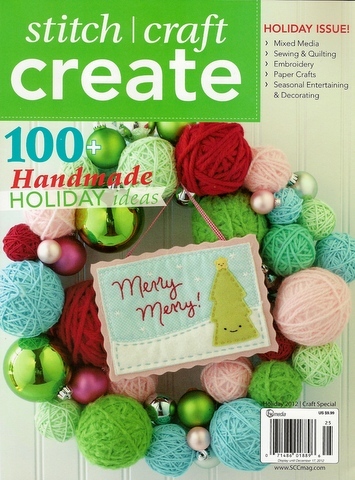 Working creatively with my hands is what gives me joy and contentment and makes me want to get up in the morning. This entry was posted in Children's Books, Fridge Magnets, Giveaways, Lilly Bug Studio and tagged Birthday cake magnets, birthday contest, birthday giveaway, Book Monster giveaway, Book Monster winner, cake flavors, handmade fridge magnets, Kindred Spirits, lilly bug boutique. Bookmark the permalink. My guess is cherry chip!! Happy Birthday!!!! I think your favorite flavor is confetti! 🙂 (At least, it’s my favorite!) Happy Birthday! Marble Cream is my guess! I love all the cakes but love the marble once the best. Great job as usual Ms. Christine. I say confetti because it’s seems happy, like Christine. I’m going to go with Pink Brown marble..but they all look delicious! Hmm…this is a tough one! They all look so tasty! I’m guessing Cherry Chip! Thanks for the giveaway! I think about Marble Pink Frosting as her favorite.